Tell ABC and Tom Llamas to apologize now! 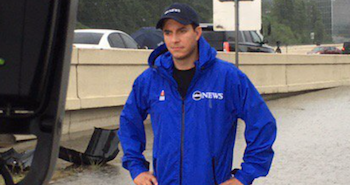 ABC News anchor, Tom Llamas, in Houston to report on Hurricane Harvey, spotted Texans who had recently lost everything entering a grocery store. Instead of reporting on the desperate circumstances with compassion, he actually diverted first responder resources that could be used to save stranded families--and called the police. That's right. Houstonians desperately searching for uncontaminated food and water in order to survive were not only shamed and blasted on social media, but confronted with police as they fought for their lives. To make matters worse, local authorities have stated that anyone found “looting” will be faced with mandatory jail time. ABC News and Tom Llamas have put victims of Hurricane Harvey in danger even though they have already lost everything. We are asking you and reporter, Tom Llamas to issue an apology. Instead of reporting on the desperate circumstances of Hurricane Harvey with compassion, he actually diverted first responder resources that could be used to save stranded families--and called the police on victims searching for food. In times of emergency and natural disaster, television news is often the only way that bystanders can ascertain what's happening. News media has the sacred duty of framing tragedies in an honest, unbiased, and compassionate manner.